“Hello, I’m Severn Suzuki speaking for E.C.O. – The Environmental Children’s Organization. We are a group of twelve and thirteen-year-olds from Canada trying to make a difference… We raised all the money ourselves to come six thousand miles to tell you adults you must change your ways. Coming here today, I have no hidden agenda. I am fighting for my future. Losing my future is not like losing an election or a few points on the stock market. I am here to speak for all generations to come. I am here to speak on behalf of the starving children around the world whose cries go unheard. I am here to speak for the countless animals dying across this planet because they have nowhere left to go. We cannot afford to be not heard. I am afraid to go out in the sun now because of the holes in the ozone. I am afraid to breathe the air because I don’t know what chemicals are in it. I used to go fishing in Vancouver with my dad until just a few years ago we found the fish full of cancers. And now we hear about animals and plants going extinct every day — vanishing forever. All this is happening before our eyes and yet we act as if we have all the time we want and all the solutions. I’m only a child and I don’t have all the solutions, but I want you to realise, neither do you! You don’t know how to fix the holes in our ozone layer. You don’t know how to bring salmon back up a dead stream. You don’t know how to bring back an animal now extinct. And you can’t bring back forests that once grew where there is now desert. I’m only a child yet I know we are all in this together and should act as one single world towards one single goal. In my anger, I am not blind, and in my fear, I am not afraid to tell the world how I feel. At school, even in kindergarten, you teach us to behave in the world. You teach us: not to fight with others, to work things out, to respect others, to clean up our mess, not to hurt other creatures to share – not be greedy. Do not forget why you’re attending these conferences, who you’re doing this for — we are your own children. You are deciding what kind of world we will grow up in. Parents should be able to comfort their children by saying “everything’s going to be alright,” “we’re doing the best we can” and “it’s not the end of the world”. Severn Cullis-Suzuki was born and raised in Vancouver, British Columbia. Her father, geneticist and environmental activist David Suzuki, is a third-generation Japanese Canadian. At age 9, she founded the Environmental Children’s Organization (ECO), a group of children dedicated to learning and teaching other youngsters about environmental issues. 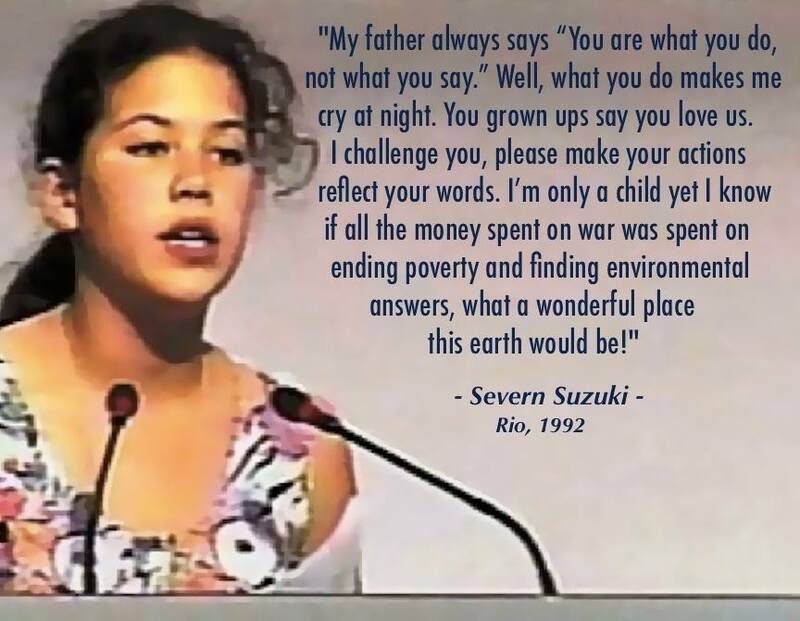 In 1992, at age 12, she raised money with members of ECO to attend the Earth Summit in Rio de Janeiro, where she was applauded for this speech to the delegates. The video has since become a viral hit, popularly known as “The Girl Who Silenced the World for 5 Minutes”. Cullis-Suzuki graduated from Yale University in 2002 with a B.S. in ecology and evolutionary biology. Severn is married and lives with her husband and two children in Haida Gwaii, British Columbia, formerly the Queen Charlotte Islands. She is the main character in the documentary film Severn, the Voice of Our Children, directed by Jean-Paul Jaud and released theatrically in France on November 10, 2010. This entry was posted in Creative Systems Thinking and tagged #EarthDay, #LoveEarth, #NatureSpirituality, earth day, ecology, interdependence, nature's paradigm, new paradigm, Severn Suzuki, systems thinking, wisdom. Bookmark the permalink.